78 floors, protruding 226m towards the sky; with 1261 rooms, 16 restaurants and bars. 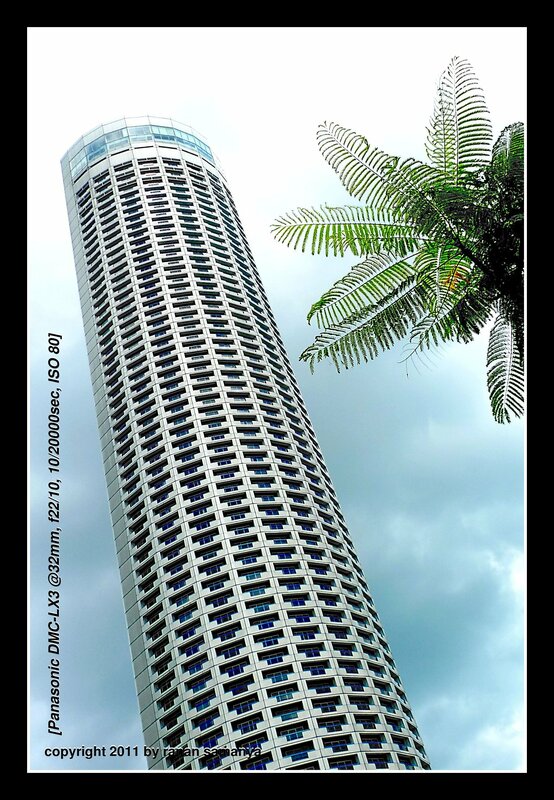 This is Singapore’s tallest hotel: Swissôtel the Stamford. I zoomed in a bit instead of using the full 24mm the LX3 is capable of as other unwanted objects were obstructing. Using f/2.2 was actually a mistake, but it appeared to be the best in composition, and was neither too bad in lighting nor sharpness. The sky was very bright at around noon; I needed to do post-processing with GIMP to adjust the colour level to reduce the background brightness. If you come to this hotel, don’t forget to visit the 70th floor. They say you can even see Indonesia from here!